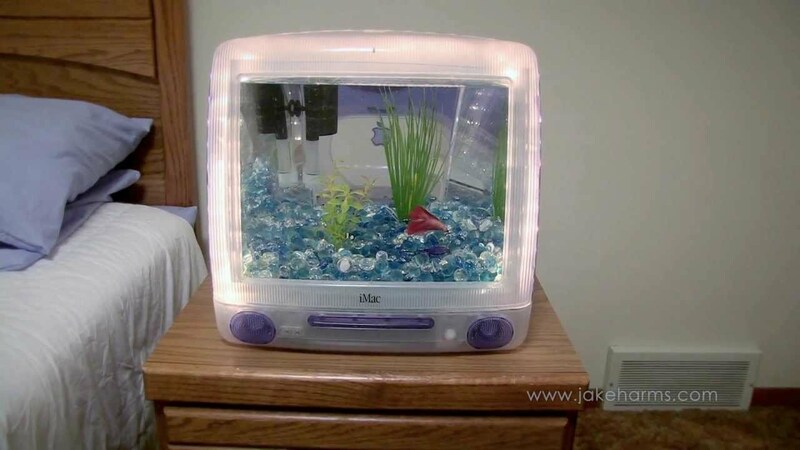 You will have probably seen pictures online of an Apple Mac Fish Tank. Indeed, it has become quite a craze and an ideal way of saving and recycling old Apple Mac PC's. (Who would have thought that you could build an aquarium from an Apple Mac Fish Tank). This Aquarium, termed the “MacQuarium” can be made to look so realistic that you would be forgiven for thinking that it was just a high-quality screensaver. In reality, a MacQuarium is much more exciting than a screensaver, and something you can create yourself from an obsolete Apple computer and a few other components. There are many instructions available on the internet, and also many ready-made MacQuariums for those without the time or energy to create their own. Source an Apple computer This is obvious. Any Mac Classic or CRT iMac will great home for your fish, but obviously, it’s best to use a computer that is no longer working rather than convert a perfectly fine Mac into a fish tank. You will need to remove all the screws and completely take apart the casing and this can be quite fiddly and frustrating. Because of this, it’s best to hold off on buying the other things you need for a while, just in case you abandon this project! Remove casing and hollow out shell – Remove the casing by pulling it up and using equal force on both sides. Then it’s time to hollow out the shell of the Mac. This step involves removing all the internal features and technological components of the Mac. Be careful of the CRT – if the computer has been used recently, it may contain enough electric current to give you a dangerously strong shock - SO BE VERY CAREFUL. Remove protrusions – With a hacksaw, remove all the parts of the back and the front cover that is protruding from the casing, and smooth everything down with sandpaper. Construct the tank – Once you have your empty shell, it’s time to construct the actual tank to go inside it. You need to either buy a glass box that fits or commission a pet store that makes custom fish tanks to do it for you or build the tank yourself. Once your fish tank is all constructed, it’s time to fit the Mac case around it. The extras – Buy gravel, plants, and of course fish to add to your tank. These will need to be added before the glass tank is fitted inside the computer shell, and then, voila, you have your completed tank ready for every single person that sees it comment on! We hope you have found these directions to be helpful in your quest to create the ultimate Mac aquarium when it comes to innovation. 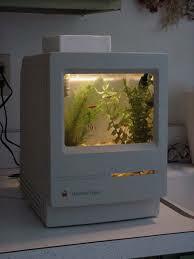 Now, you too can enjoy the benefit of having your very own Apple Mac Fish Tank in the comfort of your own home! I enjoy feedback on the content from my site's visitors ... so why not join and have your say .... please send your message to us by clicking on the contact us link. ... and if you found this page useful or enjoyable I would really appreciate a information to new fish tank enthusiasts. Thank you so much. Click here to read the latest news. © Copyright 2012 - 2019 - www.Whichfishtank.com. All rights reserved.